The Rev. Dr. Harvey H. Guthrie, Jr., sometime dean of the Episcopal Divinity School, Cambridge, Massachusetts, and retired rector of St. Andrew’s Episcopal Church, Ann Arbor, Michigan, died on Dec.17in Oxnard, California. He had lived in retirement near Fillmore, California, since 1995. 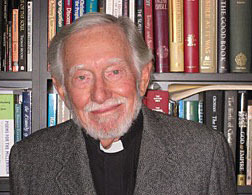 Serving as the head of one of the Episcopal Church’s leading seminaries from 1969 to 1985, a period of upheaval and change in the church and in higher education, Guthrie led in the creation of the Episcopal Divinity School from a merger of the Episcopal Theological School in Cambridge and the Philadelphia Divinity School, in the appointment to its faculty of ordained as well as lay women, and in sometimes controversial curricular innovation stressing individual student initiative based on experience and involvement in ministry. His educational perspective was ecumenical. He was a leader in the founding of the Boston Theological Institute, a consortium of theological schools in the Boston area, in the bringing of the Jesuit Weston School of Theology into a shared-facilities relationship with EDS involving a joint library program and much joint teaching, and as a holder of many offices including the presidency of the Association of Theological Schools in the United States and Canada. Guthrie also participated in a historic period in the life of the Episcopal Church as a deputy to its General Conventions from 1973 to 1982, as a leader in the movement for the ordination of women, as a participant in the deliberations leading to the 1979 revision of the Book of Common Prayer, and as a long-time advocate for the recognition of gay and lesbian unions and the ordination of openly homosexual members of the church. For many years, he chaired the council of deans of Episcopal seminaries. In 1985, after 35 years as a seminary teacher and administrator, Guthrie accepted a call to be rector of St. Andrew’s Church, Ann Arbor, Michigan. He saw his ten-year ministry there as practical application of his years of study of the church’s biblical and liturgical heritage. He led in establishing the liturgy as the center of parish life and in the refurbishing of a 19th century building to fit current liturgical practice. At the same time, he presided over a parish much involved in community service and issues, a significant part of whose ministry was a daily meal program for all who would come. His commitment to ecumenism continued in Ann Arbor, and he was a leader both in relationships among the churches and in the founding of an interfaith association including Jews and Muslims and Buddhists as well as Christians. After his retirement in 1995, he continued occasional preaching and teaching, and worked as a legal aid volunteer, counseling and representing claimants of Social Security and welfare benefits at appeals. In 2012, he was honored by the Diocese of Los Angeles by being appointed an honorary canon. Guthrie’s early contributions were as a teacher and scholar in biblical studies, particularly of the Hebrew Scriptures. He was the author of God and History in the Old Testament, Israel’s Sacred Songs, and Theology as Thanksgiving: from Israel’s Psalms to the Church’s Eucharist, as well as numerous articles and reviews. He was an instructor at the General Theological Seminary, New York, 1953-58, and a professor at the school in Cambridge from 1958, continuing to hold his chair and teach after becoming its dean in 1969. He had been a visiting lecturer at Columbia University, Andover-Newton Theological School, and St. George’s College in Jerusalem, a visiting scholar at Yale and at Göttingen University in Germany, and the Selwyn Lecturer in the Church in the Province of New Zealand. The Episcopal Divinity School honored him with the endowment of the Harvey H. Guthrie Professorship of Biblical Studies. He was preceded in death by his wife of 70 years, Doris Peyton Guthrie, and their oldest son, Lawrence. He is survived by his three remaining children, Lynn, Stephen, and Andrew, and by three grandchildren, as well as by his brother, Jim. The Episcopal Church’s Burial Office and Eucharist will be celebrated at Trinity Episcopal Church, Fillmore, California, on Feb.17 at 10a.m. In lieu of flowers, contributions can be made to One Step a la Vez (http://www.myonestep.org/) and Trinity Episcopal Church (PO Box 306, Fillmore, CA 93016). — This obituary was submitted by the Guthrie family.